The author, Richard Marsden, watches students spar with Polish Sabers. As the instructor, I watch a person fence then try to give them personalized advice and attention. Drills and class activities are fine, but students are all different and have different needs. In this case, a 5 foot tall student and her 6 foot 4 opponent are not going to get the same advice on how to be better fencers. Last week I covered the value of sparring and its limitations. This week I will be discussing the topic of Instructor Qualifications. Throughout the Martial Arts world, be it in HEMA, or any other discipline there is a looming fear instructors have. Am I a fraud? This question is answered numerous ways. Some instructors become cult-leaders, followed by sycophants, they confirm through their followers that they indeed not only know what they are doing, they also have special knowledge. The internet is filled with examples and videos of these instructors demonstrating near-magical powers. While the average person looks at this and laughs, one has to remember the instructor in said videos has followers. On some level, everyone in the video believes. See for yourself. Other instructors define themselves as qualified through belts. If someone has a 10th degree black belt in karate, that wasn't just handed out. Each degree of a belt signifies some level of accomplishment. While those outside the world of a discipline might scoff, those within tend to acknowledge it. Yet other instructors have defined themselves through accomplishments. Someone who has won competitive martial arts tournaments over and over knows what they are doing. So, what makes an instructor qualified then in HEMA. None of the above work well for HEMA at this time. Cult leaders eventually collapse under their own fantasy. HEMA has not been established long enough to be handing out belts to people with 40 years of experience. While HEMA has some serious tournament studs, who have gobbled up all the medals- that does not make them a good instructor. The two are not related, rather one (winning) assists the other (teaching). What makes an Instructor Qualified? The HEMA Alliance has an Instructor Certification program to help those teaching have their abilities verified by their peers. The program is, all in all, young and it is by no means perfect- but it is a start and it is the best way for a person involved in HEMA to get recognized as a qualified instructor. The Instructor Certification program is designed to see if an instructor is qualified. Not if they are a great teacher, just that they can indeed teach. The test is conducted by a board of established HEMA people who in turn rate an instructor on a variety of skills. Does the instructor have a written curriculum and what is in it? The curriculum can be very detailed or more generic depending on the instructor's situation. Can the instructor fence? The instructor do not need to be able to win at tournaments, just be able to demonstrate that they can perform under pressure and practice what they preach. Does the instructor know their source material? To keep HEMA about history and sources, the instructor has to be able to clearly understand the material from which they teach others. Does the instructor know the reasoning behind what they teach? An instructor has to demonstrate they know how structure works, or the 'why' behind the techniques. This also helps in demonstrating techniques under sub-optimal or unique situations. Finally, can the instructor present? All the information in the world is no good if it cannot be clearly shared and expressed. The HEMA Alliance has been slowly, but surely, certifying instructors. In the Phoenix Society we have four certified instructors, myself included, and soon as we are able I expect two more. Meanwhile I have sat on numerous certification boards. Everyone is different in how they go through the process and beyond the guidelines above, it is up to the instructor to figure out how best to demonstrate that they are capable. My pass rate is about 50% with instructors who fail given a chance to fix up whatever they had in error. The HEMA Instructor Certification puts the onus on the instructor. An instructor has to want it and go through the motions and if they are not a recent HEMA Alliance member, pay for the test. The test is not handed out, but must be sought. HEMA is relatively young. While there are some with many years of experience, a great majority of us came from different paths that lend itself to HEMA or are new to it. While a veteran in judo might be seen as someone with over 20 years of experience, in HEMA it is not unusual for an instructor to have only five to six years of experience. More than once I have had young instructors come to me and ask if they should be teaching at all? The answer to that is yes. If HEMA had a large body of people with decades upon decades of experience, my answer might be different. As it is, I believe not only should younger instructors teach, as they learn more and get better at teaching they should encourage their students to teach. It is our job, in these early days of HEMA to try and grow it and try and create as many instructors as we can so as to continue growing it. Cult leaders do not provide growth, we do not have the age to have belts and we don't have enough tournament winners who are great teachers to rely on. Being young as an instructor has pitfalls, but with honesty they can be overcome. Young instructors should tell their students that they are learning as much as they are. They just happen to know more. It is not necessary to be infallible. The instructor still needs to maintain class discipline, but they need not portray themselves as something they are not. That is how cult leaders are created. Young instructors need to read the source material repeatedly. Learning from an older instructor is good, but a young instructor needs to read the source material on their own. 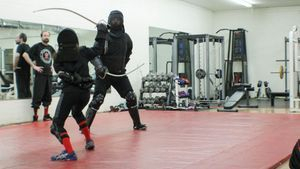 It is human nature to personalize systems on some level and if a young instructor simply mimics the older- they are missing out on a deeper understanding of HEMA. In the Phoenix Society, it is quite natural for my young instructors to copy me- at first. However, once they are able to do that I push them to read the source material. My own students will then at times seek me out and give their interpretation of a technique that is different than mine. Rather than tell them 'no', I usually read the technique in question, explain why I teach it the way they do and ask them to do the same. If they have a valid, thought out answer, even if it is different than mine, I tell them to keep doing it that way. With some of our source material instructions are not clear and so I fully believe there are many roads to Rome. Young instructors need to be willing to change their minds when they make errors. This really goes for older instructors as well. Time makes us rethink things and source material can be re-read and a new idea formed. Throughout my HEMA life as a teacher I have video evidence of my thinking as it has changed. A way I performed a technique one year, may be different years later, and I may even go back after that! A perfect understanding can be difficult because we do not have the masters to question directly, only what they left behind. 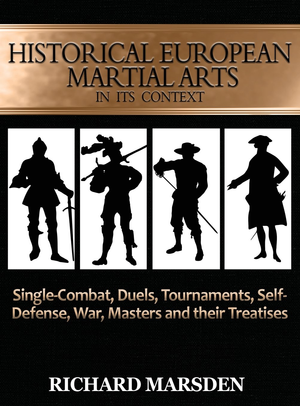 Finally, young instructors should know the history behind the HEMA. Which is a great segway into pitching for my book! War, the Masters and their Treatises. Over 200 pages, full high quality color and hardback!